Medley was a medieval manor, to the north west of Oxford and ust outside the jurisdiction of the city government. There was a manor house here, which in 1509 became the house of the Abbot of Osney. It was closely associated with the nearby hamlet of Binsey. In the 18th century it was a popular for townsfolk to walk to Medley and Binsey across the Port Meadow and the owners of the Medley estate ran a public house here. In about 1723, the owner Benjamin Sweet built a house here. It had a symmetrical east front of 5 bays and a walled garden running down to the River Thames. 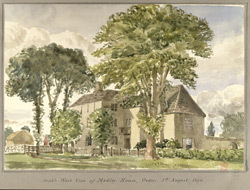 By 1829 the Medley estate was owned by William Tuckwell.